A panel of expert historians and historic-landscape stewards will explore the relationship between two of America’s greatest nineteenth-century Romantic landscapes: Frederick Law Olmsted and Calvert Vaux’s Central Park, and Frederic Church’s villa and landscape garden, Olana. Speakers include Sara Cedar Miller, Central Park Conservancy historian and photographer and author of Central Park: An American Masterpiece; Katherine H. Kerin, Olana landscape curator; and Evelyn D. Trebilcock, Olana curator. Elizabeth Barlow Rogers, president of the Foundation for Landscape Studies, will moderate. 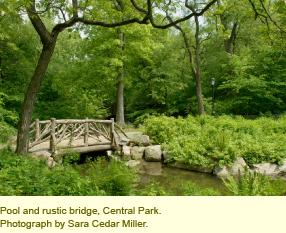 This program is cosponsored by The Olana Partnership, the Central Park Conservancy, and the Foundation for Landscape Studies. Tickets: $15 for nonmembers; $10 for Morgan, Olana Partnership, and Central Park Conservancy members.